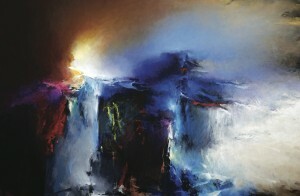 The University of Maine at Presque Isle’s Reed Fine Art Gallery will presentRevelations by UMPI Art Professor Anderson Giles from April 22 through June 8, 2013. The public is invited to view the exhibition throughout the show’s run and gather for a gallery reception, being held in conjunction with the Presque Isle First Friday Art Walk, on Friday, May 3 from 5-7 p.m. A gallery talk with the artist will take place at 5:30 p.m. This exhibition is dedicated in memory of his brother, Charles Giles. Revelations will be on display from April 22 through June 8, 2013, in the Reed Gallery. There will be a First Friday Reception during the May 3 Art Walk, from 5-7 p.m. The reception is free and open to the public. Light refreshments will be served. Revelations will also be open to the public for the June 7 First Friday Art Walk, from 5-7 p.m. The Reed Fine Art Gallery is open Monday through Saturday, 9 a.m. to 4 p.m. The gallery is closed Sundays and University holidays. For more information about this event, please contact Sincavage at 768-9442 or heather.sincavage@maine.edu.